Athletes, busy parents, and active people of all types are often tempted to “shake it off” or “tough it out,” but this is not a good idea if you want your wrist to heal as quickly as possible. Continuing to use your wrist after it is sprained may prolong your injury and lead to more pain and discomfort. It may be difficult, but the best thing to do is rest and give your body the chance to heal on its own. What you should do instead: Rest your body, especially your wrist, and stop any activity that causes pain. Consider immobilizing your wrist with a brace or splint to prevent movement in the joint. Many people choose to take over-the-counter medications to help relieve the pain and swelling caused by a sprained wrist. This may generally be a good idea; however, taking too much medication may cause unwanted side effects and potentially be unsafe. Taking too much medication may also dull the pain to the point that your symptoms are masked. This is risky because it allows you to use your wrist when you should be resting it, potentially making the injury worse. As always, discuss your options with your healthcare professional. What you should do instead: Apply ice and elevate your wrist above the level of your heart. Take only the recommended amount of medication. If the pain persists for more than a few days or if your medication isn’t helping, talk to your doctor to ensure you have been properly diagnosed. 3. Don’t underestimate your injury. In most cases, a sprained wrist will heal on its own and you can treat it at home. However, if you choose not to seek a diagnosis from a doctor, it’s important not to underestimate the seriousness of your injury. What feels like a sprained wrist could actually be a bone fracture or a torn ligament, both of which should be treated by a medical professional. Even if it is just a sprain, it’s important to allow it to properly heal before resuming normal activity. If you don’t, you may prolong the discomfort and possibly worsen the injury. What you should do instead: Seek medical advice if your injury hasn’t started healing after a couple of days. 4. Don’t stop worrying about it after it heals. In many cases a sprained wrist is a one-time event, but after you have sustained this type of injury you are at a higher risk for reinjury if you don’t take preventive action, potentially leading to chronic wrist sprains. This is especially true for athletes who do repetitive motions or other activities that strain the wrists. What you should do instead: Perform stretches and strengthening exercises to help prevent future wrist sprains. Strengthening the muscles surrounding the wrist joint may help maintain alignment, and stretching may help prevent overstretching in the surrounding muscles and ligaments. For most people, a sprained wrist is both inconvenient and uncomfortable. Knowing what to do, and what not to do, after sustaining this type of injury may help you heal faster and help prevent future injuries. 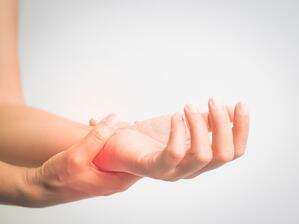 If you have sprained your wrist, consider renting a cold therapy system for home use. A cold therapy system is more effective than ice packs and more convenient because the system does everything for you by providing consistent therapeutic cold and active compression at the same time. Contact Game Ready or find a provider near you to learn more.